1usdhostingc Review 2019: Is 1usdhostingc a Good Hosting? 1USDHosting offers a range of incredibly cheap shared hosting, VPS services, and with little to no downtime all backed by a money back guarantee. With a range of low-priced shared hosting plans, VPS and dedicated servers, 1USDHosting is one of the cheapest hosting services on the market. Starting with the 1.0 package, you get two domains, ten subdomains, 1GB disk storage, 10GB bandwidth, ten emails, and two databases. If you upgrade to the 5.0 package, you get ten domains, unlimited subdomains, 5GB disk space, 150GB bandwidth, and unlimited email and databases. With the 101 package, you get 30 domains, 10GB disk space, 300GB bandwidth and everything unlimited plus a free .com domain. The 110 package, which is their ultimate plan, gives you everything else unlimited plus a free .com domain for one year. 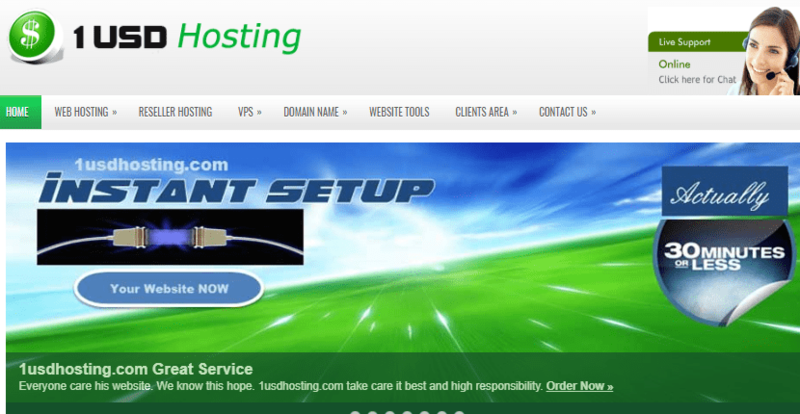 If you’re looking for a hosting account with different IPs, I recommend their Multiple IP Hosting service. This package gives you a number of IPs (for your websites) each with its own DNS, the latest ZPanel control, and free WordPress setup. Though there is no extra monthly charge, you will pay for each IP address that you acquire. Windows hosting plans – with Plesk and pretty much the same features as Linux – are available to customers who want a familiar environment. Their starter package W1 plan comes with 1GB disk space and 10GB data transfer. The W2 plan includes 3GB disk space with the same data transfer speed and the W3 plan comes with 5GB disk space and 20GB data transfer. If you need more processing power or storage, you can choose the W4 plan with 10GB storage and 40GB data transfer or the W5 plan with 25GB storage space and 100GB data transfer. Both plans also include unlimited subdomains and emails. If you have been hosting websites for a number of years, you know the importance of backups. There are times when scripts misbehave and you lose your data or even your website. It is always good to have something to fall back on. With 1USDHosting, you get regular automatic backups of all your websites, emails, and databases. 1USDHosting gives you all the tools that you need to manage your website, databases, and emails. From the control panel, you can install your favorite CMS, set preferences, update passwords, upload or backup files, configure email accounts, run scripts, and manage DNS. My only concern is that their website is outdated and not compatible with mobile phones. If you’re visiting for the first time, you may have problems comparing plans. A new design and a bit of organization could eliminate the hassle of navigating the website. True to their name, they have a couple of hosting plans all under a dollar. With a range of hosting packages, you will not have a problem finding a plan that fits your budget. Set up is instant. I like the fact that they don’t include charges such as setup fee or VAT. You can order a hosting package along with extras, such as emails, SSL, and additional IPs and pay monthly, quarterly, or annually. The one thing that I find quite disappointing with 1USD Hosting is that they don’t provide 24/7 live chat or telephone support to customers. Though they indicate there’s live chat; instead, it directs you to their support page. Your recourse would be to open a ticket, shoot an email, or send a message via their online contact form. I doubt if their responses are fast, but they will still get back to you at some point. Though support is limited, they have a knowledge base with good hosting tutorials and a forum where you can interact with other customers. With a number of low-priced hosting plans, 1USD Hosting is a good choice for customers who are more concerned about costs than the depth and number of hosting features and resources. Wondering how 1usdhostingc stacks up against other Web Hosting companies? Enter any other Web Hosting company and we will give you a side-by-side comparison.